3. Elegant Table Decor. 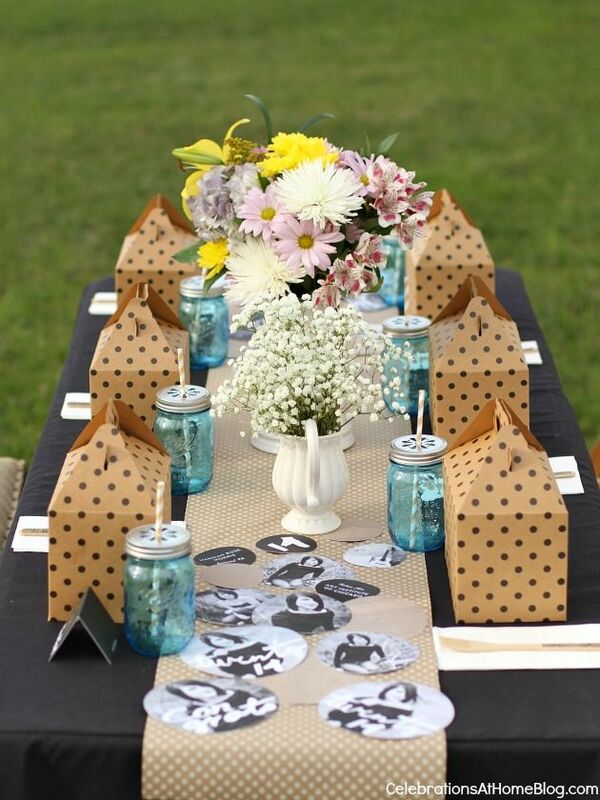 This graduation party idea features an elegant table display using a chic, black tablecloth filled with flowers, mason jars, gift boxes and our Painted Year Table Decor personalized with photos of the graduate. Take inspiration from this idea and add your personal twist to it. 4. Wall of Memories. 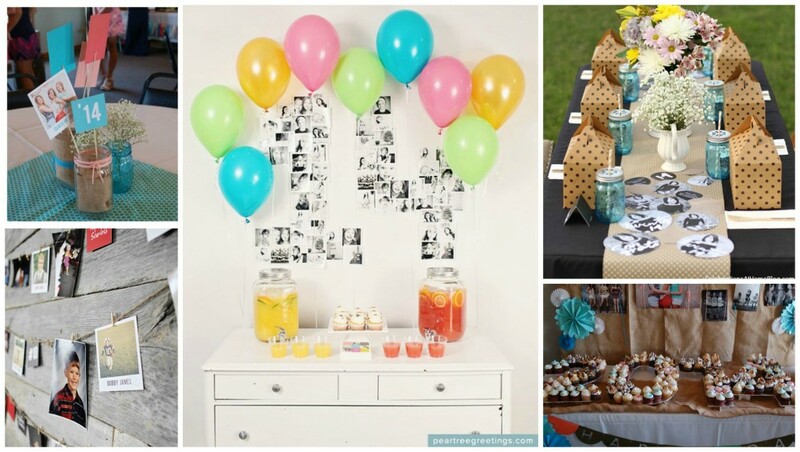 This graduation party idea came from our All Star Graduation Party that incorporated various sports-themed ideas. You can create your own wall of memories using photos from the graduate from baby through senior year. 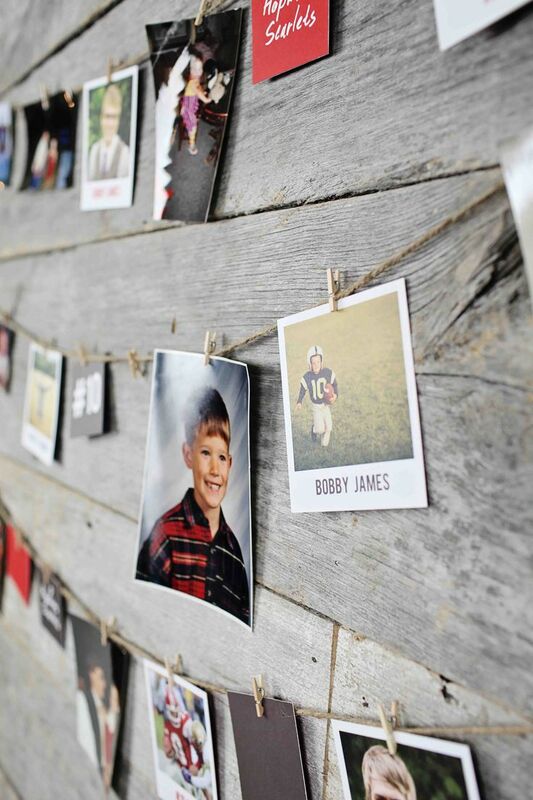 We also incorporated our Snapshot Photo Table Decor to highlight some of our favorite photos and text that was important to the graduate (like the name of his high school and his football number). Once you have the photos and table decor you like, clothespin them to twine to get this rustic look. 5. Standout Centerpieces. This idea, like The Year in Cupcakes from above, is from one of our Featured Favorites who planned a joint graduation party. To create the look, this mom used various sizes of mason jars and added a blue mason jar for a pop of color. 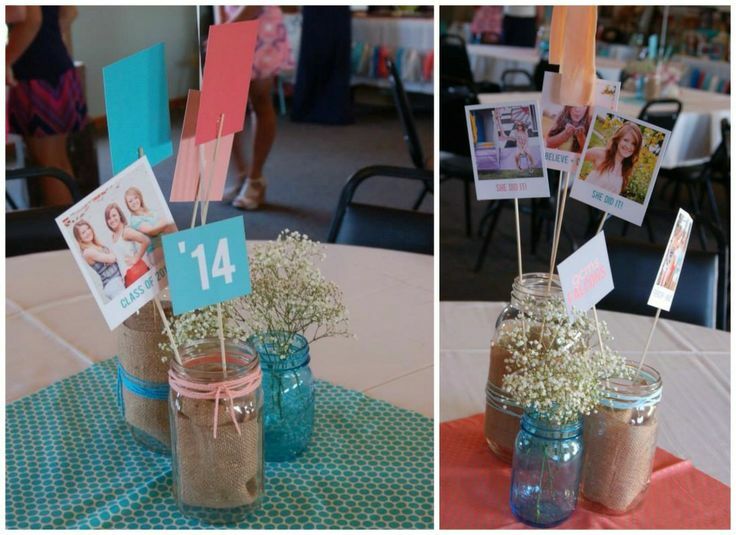 She lined the clear jars with burlap, tied pink or blue string around the top or middle of the jars and added our Snapshot Photo Table Decor taped on wooden sticks. In the blue mason jars, she added sprigs of baby’s breath for a classic look. Under each centerpiece, she layered blue or pink fabric that coordinated with the table decor and invitation. Beautiful. 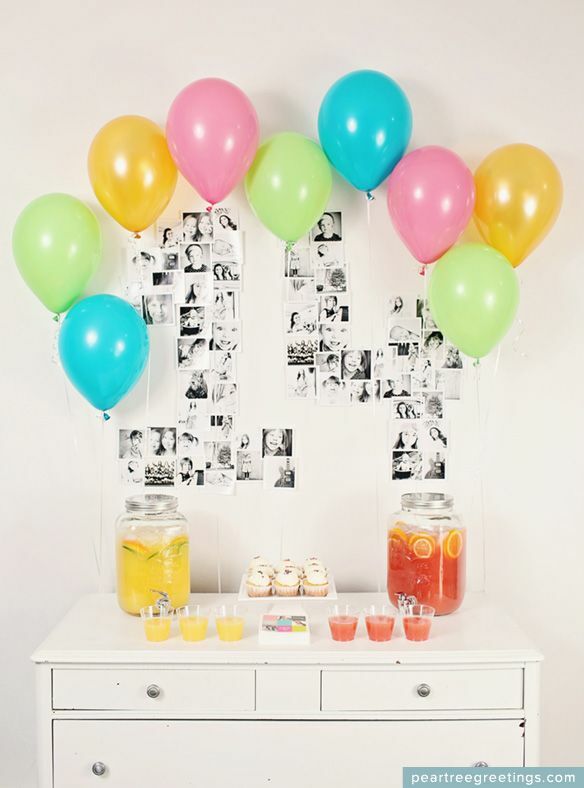 There you have our top 5 graduation party ideas to make your party personalized and memorable for your guests to enjoy! 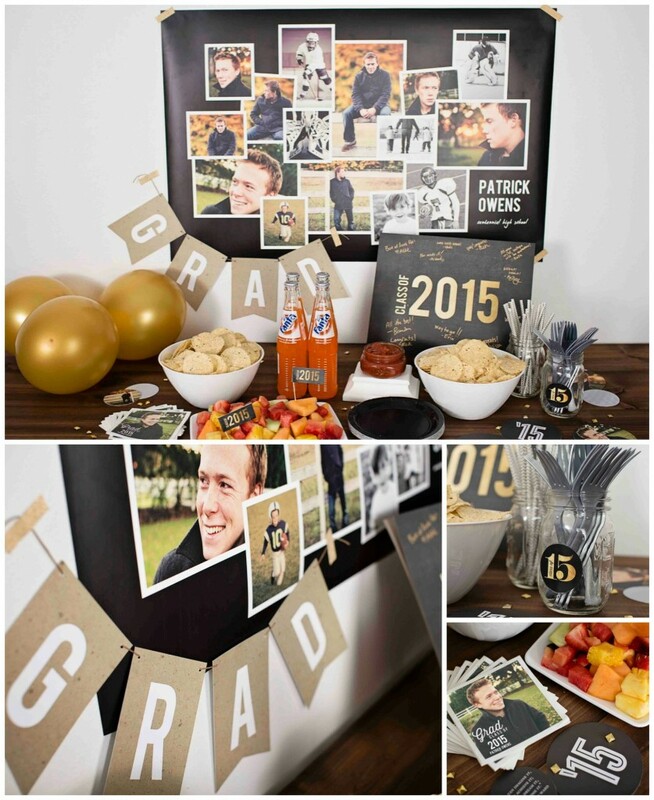 Start personalizing your graduation announcements and graduation party decorations today. 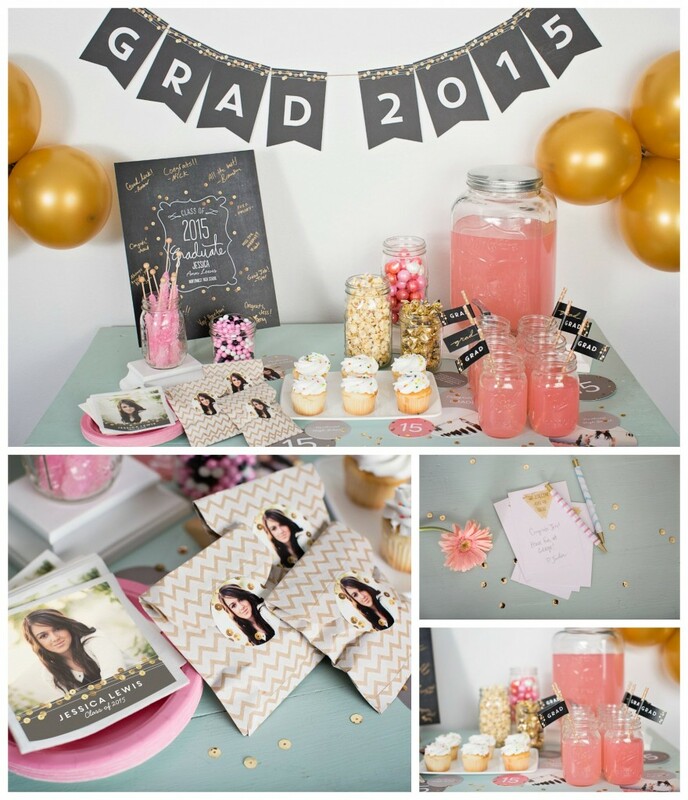 If you’re looking for more graduation party inspiration, read our Classic Graduation Party Ideas and Sequin-Inspired Graduation Party Ideas. Great ideas! 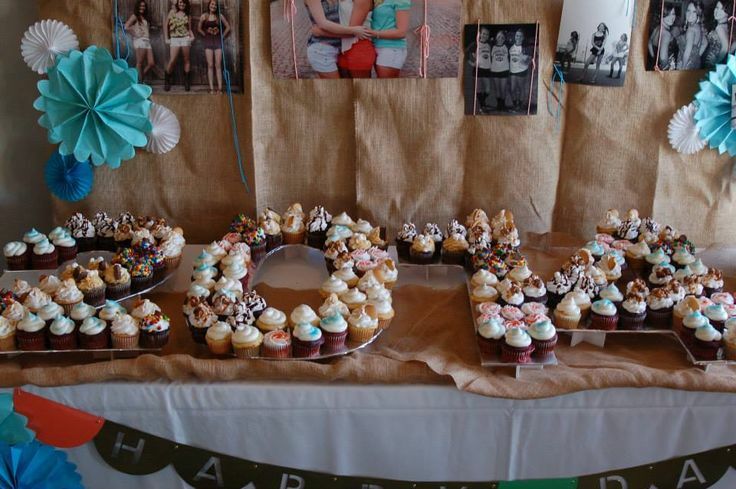 I love the year in cupcakes idea as well as the wall of memories. Thanks for sharing! Thanks, Lauren!! Yes, the Year in Cupcakes has been very popular with our fans. Great to hear you liked these graduation ideas! About how many cupcakes would you need for the year cupcake display? Hi Terri, good question! I would say it depends on how many people you are planning to have at the graduation party. Shown in this picture it’s about 180 cupcakes, but if you plan to have more people you can always add more to the display when guests take one. If you aren’t expecting that many guests, you could always make the last two digits for the year: ’15 or spread them out more on the numbers or even make smaller numbers. Either way you choose, I would suggest catering it towards how many guests you are planning to have so you don’t have lots of extras or not enough 🙂 Hope that helps. Thank you for your question. Enjoy your party! !